In moderation, cheese is a nutritious food. Like the milk it's made from, cheese is rich in both calcium needed for strong bones and protein needed for muscle growth and maintenance. Cheese may have sleep-inducing qualities as well. However, many cheeses are also high in fat, which could cause digestive discomfort and disrupt your sleep if you eat it too close to bedtime. Choose the right cheeses for a late-night snack that won't keep you up all night. A major cheese myth is that eating it before bed gives you bad dreams. In fact, the opposite may be true, according to a 2005 British Cheese Board study. Researchers gave 200 participants a little less than an ounce of cheese 30 minutes before bedtime and asked them to make note of their dreams. Of those who remembered their dreams, none reported nightmares. In fact, participants reported pleasant dreams as a result of the cheese. The British Cheese Board study participants also reported that eating cheese before bed helped them fall asleep more easily. Researchers hypothesize that this is due to an abundance of an amino acid called tryptophan found in cheese, which your body uses to produce the feel-good hormone serotonin that helps regulate mood. This is also what makes you feel calm and able to drift off to sleep at night. The University of Michigan Health System reports that tryptophan is highly effective at promoting sleep in people with insomnia. Of all the macronutrients -- carbohydrates, fat and protein -- fat takes the longest to digest. This means that if you eat a high-fat cheese just before bed, your body may still be working to digest it when you're trying to fall asleep, which can lead to discomfort and disrupted sleep. To avoid this, choose nonfat or low-fat cheeses, such as nonfat cottage cheese, and low-fat mozzarella and ricotta, which the University of Rochester Medical Center reports taste very similar to the regular, full-fat varieties. Stick to a single serving, which is 4 ounces of cottage cheese and 1 ounce of all other cheeses. Besides the fat in cheese keeping you up at night, eating too much of it is unhealthy. Cheese is high in saturated fat and cholesterol, too much of which can increase your risk of heart disease. 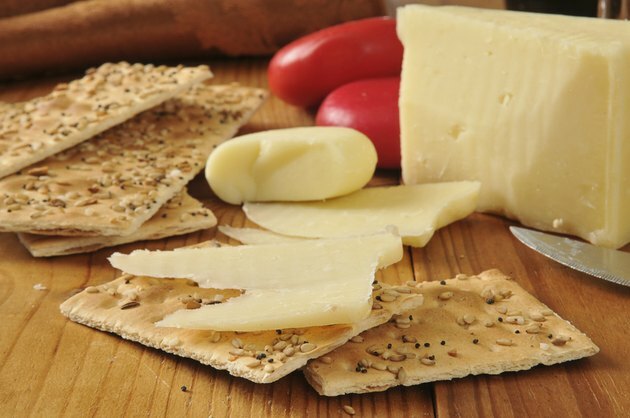 To make your snack satiating, pair the cheese with whole-grain crackers or fresh fruit. Berkeley Wellness: Is Cheese Bad For Your Health?